You’d have to be on the Moon not to know that Kinect‘s launch date is almost here. With all those commercials and shopping mall displays everywhere, it really is hard to miss. Never fear, though, as you’ll be reminded again when you fire up your Xbox 360 today and receive the brand-spanking-new Kinect-friendly Dashboard. Although this is an update in preparation for the grand launch of the motion peripheral, it’s not all about waving your arms in the air; there are some pretty cool new features which will, unfortunately, vary greatly by country. 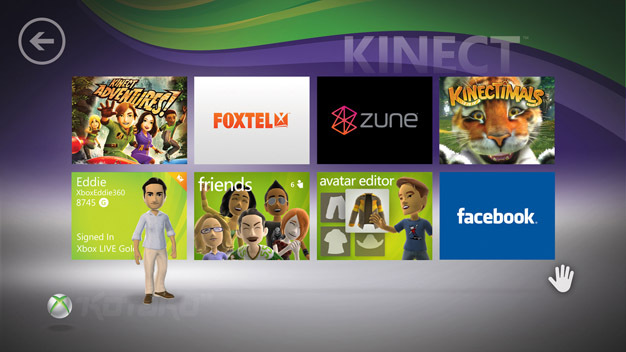 Besides the slick Windows Phone 7-inspired 2D tile effect dominating the UI, most will notice a few decent additions to their Xbox LIVE membership. American gamers will be graced with the new Netflix and ESPN streaming services promised back at E3 2010, on top of the new Zune music and movie services appearing in other selected markets worldwide. Xbox LIVE subscribers everywhere should also notice improved voice chat quality, easier Gamertag creation, wireless network connectivity enhancements and, if you’re into that kinda thing, beefier family protection settings. There’s also a “new browse experience” for 100% completed games. Some pretty welcome additions overall, especially since Xbox users are now clocking up one billion hours on Xbox LIVE each month. For a full list of new features this new update brings, check out Major Nelson’s blog. The update is accompanied by the increased service fees which are in effect as of today; as Microsoft announced back in August, some Xbox Live Gold memberships in Canada, Mexico, the UK and the US are now a teeny bit more expensive. Grab the deets on that here.